The bass saxophone is one of the largest members of the saxophone family—larger than the more commonly encountered baritone saxophone. It was the first type of saxophone presented to the public, when Adolphe Sax presented a bass saxophone in C at an exhibition in Brussels in 1841. The modern bass saxophone is a transposing instrument pitched in B♭, an octave below the tenor saxophone. The bass saxophone is not commonly used in any music, but it is heard on some 1920s jazz recordings; in free jazz; and in the saxophone choir or “large ensemble” tradition. The instrument was first used in 1844, both by Hector Berlioz in an arrangement of his Chant sacred, and by Georges Kastner in his opera Le Dernier Roi de Judas. In the 1950s and ’60s it enjoyed a brief vogue in orchestrations for musical theater: Leonard Bernstein’s original score for West Side Story includes bass saxophone, as does Meredith Willson’s Music Man and Sandy Wilson’s The Boy Friend. American composer Warren Benson has championed the use of the instrument in his music for concert band. Although bass saxophones in C were made for orchestral use, modern instruments are in B♭. This puts them a perfect fourth lower than the baritone sax and an octave lower than the tenor sax. The range is similar to that of the B♭ contrabass clarinet. Music is written in treble clef, just as for the other saxophones, with the pitches sounding two octaves and a major second lower than written. As with most other members of the saxophone family, the lowest written note is the B♭ below the staff—sounding as a concert A♭ in the first octave (~ 51.9 Hz). Until the start of the 21st century, the largest existing member of the saxophone family was the rare contrabass, pitched in E♭, a perfect fifth lower than the bass. Inventor Adolphe Sax had a patent for a subcontrabass saxophone (or bourdon saxophone), but apparently never built a fully functioning instrument. 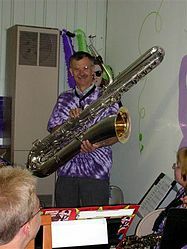 In 1999, German wind instrument maker Benedikt Eppelsheim introduced the subcontrabass tubax, a modified saxophone pitched in B♭ an octave below the bass saxophone. The bass saxophone enjoyed some measure of popularity in jazz combos and dance bands between World War I and World War II, primarily providing bass lines, although players occasionally took melodic solos. Notable players of this era include Billy Fowler, Coleman Hawkins, Otto Hardwicke (of the Duke Ellington orchestra), Adrian Rollini, Min Leibrook, Spencer Clark, and Vern Brown of the Six Brown Brothers. The bass sax become more scarce in standard jazz band instrumentation during the mid to late 20s. Sheet music of the period shows many bands photographed with a bass sax in their collection of instruments. It was sometimes played by the tuba or string bass player rather a member of the sax section. American bandleader Boyd Raeburn (1913–1966), who led an avant-garde big band in the 1940s, was a sometime bass saxophonist. In Britain, the leader of the Oscar Rabin Band also played it. Harry Gold, a member of Rabin’s band, played bass saxophone in his own band, Pieces of Eight. American bandleader Stan Kenton’s “Mellophonium Orchestra” (1960–1963) featured fourteen brass players and used a saxophone section of one alto, two tenors, baritone, and bass on Johnny Richards’ compositions. Joel Kaye played baritone and bass saxophone in that band. The ensemble recorded several successful albums, winning two Grammys. The Lawrence Welk Band featured Bill Page soloing on bass sax on several broadcasts during the 60s. Shorty Rogers’s Swingin’ Nutcracker (recorded for RCA Victor in 1960) featured a bass saxophone on four of the movements (played by Bill Hood). The 1970s traditional jazz band The Memphis Nighthawks built their sound around diminutive bass saxophonist Dave Feinman. Some revivalist bass saxophonists performing today in the 1920s-1930s style are Vince Giordano and Bert Brandsma, leader of the Dixieland Crackerjacks. Jazz players using the instrument in a more contemporary style include Roscoe Mitchell, Anthony Braxton, Peter Brötzmann, J. D. Parran, Hamiet Bluiett, James Carter, Stefan Zeniuk, Vinny Golia, Joseph Jarman, Brian Landrus, Urs Leimgruber, Tony Bevan, and Scott Robinson, although none of these uses it as his primary instrument. Alto Reed, of Bob Seger and the Silver Bullet Band, often plays bass sax during live shows on songs without a prominent sax part. Colin Stetson – touring member of Arcade Fire and Bell Orchestre. He has performed and recorded with dozens of other artists, including Tom Waits, TV on the Radio, Bon Iver, Feist and LCD Soundsystem. The bass saxophone is sometimes used as an instrument in concert bands, typically in arrangements made before 1950. It is used most frequently in saxophone choirs, specifically those in the direct legacy of teacher-soloist Sigurd Rascher. It is rarely used in orchestral music, though several examples exist. The earliest extant work to employ it is William Henry Fry’s “sacred symphony” Hagar In the Wilderness (1853), which also calls for soprano saxophone and was written for Louis-Antoine Jullien’s orchestra during its American tour, and it was used by Richard Strauss in his Sinfonia Domestica, where included in the music are parts for four saxophones including a bass saxophone in C. Arnold Schoenberg wrote for the bass sax in his one act opera Von Heute auf Morgen (“Of Today and Tomorrow”).